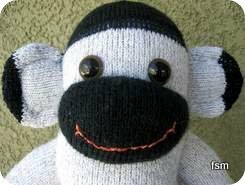 Thick lush wigwam wool socks made this fun sock monkey toy. 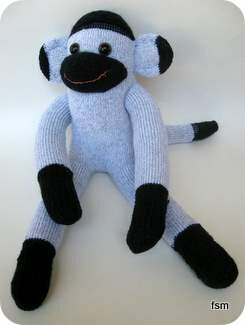 Simply follow the basic sock monkey pattern and instructions and craft those weary socks into this cute monkey doll. 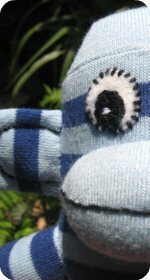 Step one: You will need wigwam moose socks. 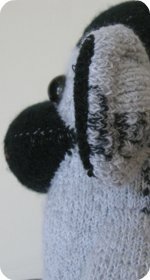 Eyes: Put plug in eyes in place before sewing the legs together on the main sock body. 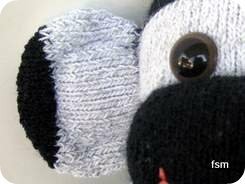 Ears: The front of each ear is cut specifically to get the navy tips. 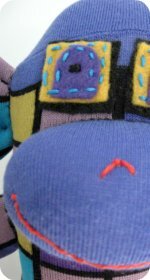 They have been embroidered with grey embroidery thread.The back of one is plain gray, the other has part of the Wigwam wording. 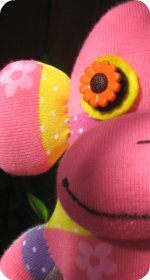 Embroider a mouth with the red embroidery thread. There is nothing at all creative been done with this little monkey. 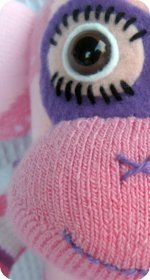 Plain sock animals like this one are great for little children as there are no extra pieces that can fall off and go into their mouths. TIP: If you want a super fast way to do eyes, then plug in eyes are the ones to use. They are way faster than any other way. They will never come off, the clasp on the back of the eyes goes on real tight. 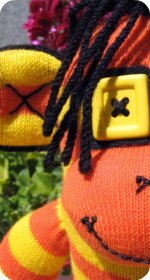 If you live in a cold area and are ordering some wigwam moose socks to make a monkey, give yourself a gift and buy some for your feet too, your feet will enjoy them!